Your garage door is the ‘other’ main entrance to your home. Most people don’t realize that when it breaks down, it can not only be expensive to fix and potentially dangerous to you and your family, it can also leave your home vulnerable to intruders. Read on to discover how we can help you keep your door in perfect working order and save you money and time. Taking Care Of Tthe "Hardware"
There are many parts that ensure your garage door works smoothly and efficiently. From the chain links to the turnbuckle, from the hinges to the screws holding the pieces together, our professionals have the right equipment to ensure that each and every part is strong, held tightly in place, well lubricated and in top working condition. Your garage door works with a system of torsion and/or extension springs that pull your door open and let it close at the click of a button. These are heavy and can weigh upwards of 150 pounds – and that’s not including what’s added by the counterweights and tension on the chains. To ensure your door is 100% safe, it must have photosensors and an automated reverse function. For the sake of your family's safety, you should check these regularly to ensure they are in premium working order. 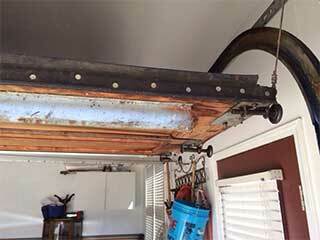 When the door is off balance, it can place pressure on the chains, gears and torsion springs. If the balance is left unchecked or unrepaired, these parts will eventually break and will not only cost you a whole lot more to fix, but could be dangerous for you and your family. If you hear loud squeaks and groans when the door is in motion, it means that it’s likely off balance. Call our professional maintenance technicians to ensure your door is serviced before any of the parts break down. Our specialists will also check all the processes to ensure that all of the parts are in excellent working condition. From the batteries to the lights, from the springs to the sensors, we can repair, tune or replace any garage door parts on the spot! Call our service hotline today to ensure your garage door is safe and always in top working condition!